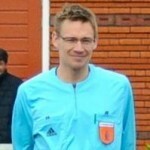 Hi Dutch Referee. Your first two points on interfering with an opponent misrepresent the condition in law. The law clearly links the two points together using the word “by”. Separating the two points broadens the condition significantly. Good point. copying from the LOTG made them appear on two lines. But bullet three would be good here in having an impact. The explanation remains the same there. Attacker being in an offside position he clearly stands on the way impeding goalkeeper, where gk cannot make a clear challenge on the ball.. I agree the attacker was in an offside position and later came from an offside position to play the ball which clearly obstruct the opponent’s line of vision. hi Patrick, don’t agree there. For me it’s not the line of vision that is obstructed, but it’s the ability to play the ball that has decreased due to the action off the attacker. I agree with every aspect of your analysis. Tadic was in an offside position, and by negatively impacting Courtois’s ability to play the ball, he was offside. The goal was correctly disallowed for that reason. To my mind, this incident is a perfect example of VAR working exactly as it was designed to do. You’re right, it’s very difficult to see what happened in read time, so VAR is necessary to ensure that the correct call was made. I believe this sort of analysis and discussion is worth its weight in gold for referees. I saw the action ‘live’, but I can say in honesty that I did not see or pick up Dusan Tadic’s position on Thibaut Courtois until I saw the replay once or twice. Although it seems obvious and not at all controversial a decision after the replay, so much was happening in the box that even with a fourth referee present, VAR helped to make the decision to disallow the goal here correct. Thanks, Jan.